Creating a Culture of Questions was, by far, the most popular post on this blog until someone somewhere starting linking to the post on Exponent Rules. I think a natural follow up to the Culture piece would be with regards to establishing a classroom culture where feedback is given and accepted. The first time students hear this, I usually get, "Gosh, that's mean." But we discuss how the first person who puts forth an idea holds the best idea as there is nothing to which we can compare it. But using the same logic, this idea should be the worst. This assumes the flow of ideas that should follow. 1. "If I go first, it doesn't matter that my idea isn't fully formed." This student has established a floor on which each other student can stand and/or build. 2. "I can take someone's idea and help them make it better." The real work is done by the first follower. This student chips away at any imperfections and helps the first student refine her idea. Subsequent students then follow suit. 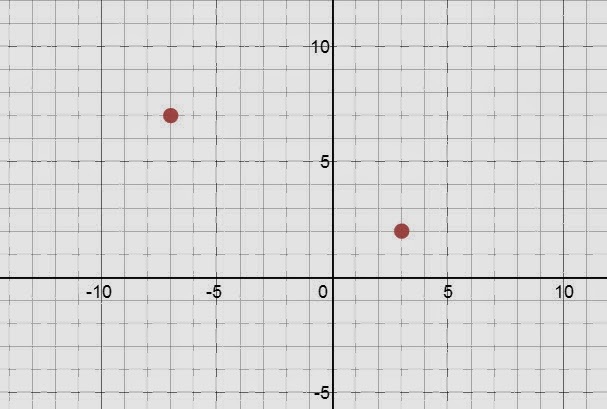 Yesterday, we trying to determine the equation between the points below and students wanted the y-intercept. Students were using what they knew about slope to find other points and had to wrestle with the fact this particular line doesn't have a lattice point for a y-intercept. Once we were finished, I asked students to write down any questions they had. Student 1: "I have a comment." 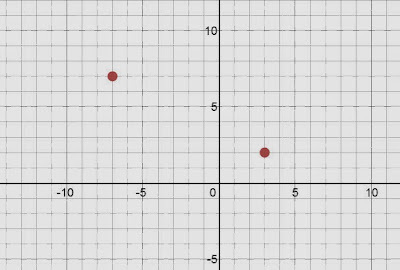 Student 1: "No matter which points we choose, the slope simplifies to the same thing." "Can you turn your observation into a question?" Student 1: "Will that happen all the time?" Now here is where it happens. "I can misunderstand [Student 1]'s question, can we make this more precise?" Student 2: "Will the slopes always simplify to the same thing?" Student 3: "Will the slopes between two points always simplify to the same thing?" "Are we only using two points?" Student 4: "Will the slopes between three points always simplify to the same thing?" Student 5: "Will the slopes between any two pairs of points always simplify to the same thing?" Student 6: "Are the slopes between any two pairs of points always equal?" "Are we really talking about any 4 points here?" Student 7: "Are the slopes between any two pairs of points on a line always equal?" I called this a Project. It's not. It's more of a problem-y kind of performance task learning opportunity assessment of for of for? learning that hits close to home. Literally. We live in a huge agricultural area and kids don't know what an acre is. Anything that gives students a chance to wrestle with the fact that a piece of land can't have dimensions of 20 acres x 20 acres, is a win. Anything that allows me to answer the question "What's an acre-foot?" by doing this, is a win. 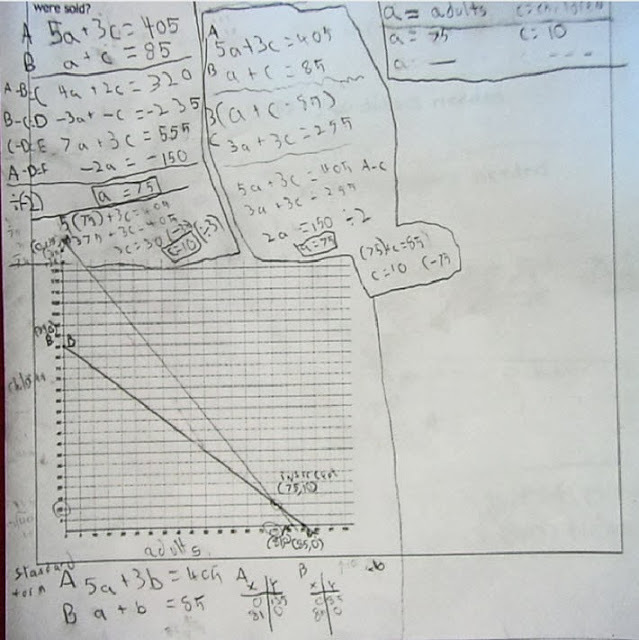 In this project problem's first iteration, I was focused on the skills of equation writing, line graphing and solving mixture and work problems. 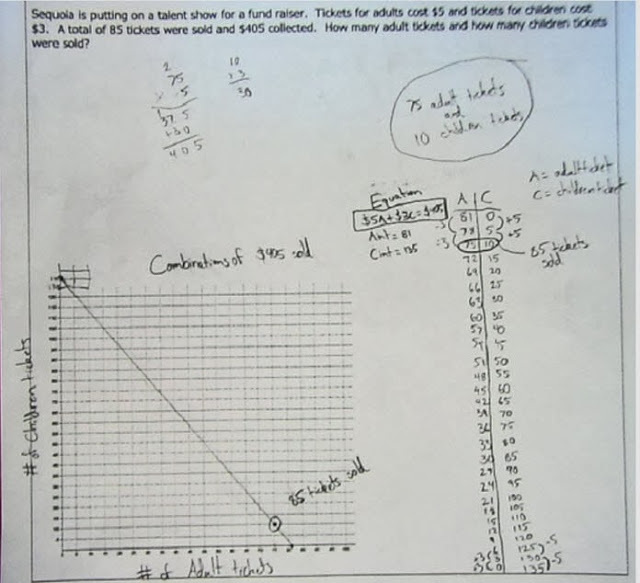 In the second iteration, I was less focused on the skills and more interested in having students explain what each component of an equation represented, why we'd want that equation and how graphing inequalities made sense. We got to discuss why understanding the problem makes sense--kids tried to hire crews to prune cotton. For you city-slickers out there--you don't prune cotton. It doesn't grow on trees. Students had to sign up via Google form to interview with me as they finished a task. I did something north of 175 interviews for one class that year. This year, I've changed it a bit more. They are no longer tasks, they're constraints. There are fewer of them and they don't specifically tell kids what to do. Before, I told them to create inequalities and graph them. Now, I'm removing some of the scaffold. They get to decide what tools they want to use. Before, I did this project after we had done systems, mixture and work problems. This time, we have only done systems. They're going to have to work through the mixture/work stuff. That's been the highlight--the mixture problems. I have a few students who went straight for that constraint and have been on a mission to figure out how to make sense of it. Today, one boy asked, "Mr. Cox, how accurate to I need to be? I'm accurate to the trillionth, but I can't get it to be exactly 36%." I said, "How accurate do you think you need to be? We're killing weeds, not sending someone to space." So, with all that, here's the updated version complete with dynamic answer key. If I know the rules, then I can do the math. If I do the math, I can know the rules. One problem with multiple paths to solution. Students connect as many skills as they can to the problem. I listed eight possible skills two of which wouldn't necessarily apply to the problem. Students had to assess themselves on the skills they demonstrated. Question of the day: "Mr. Cox, is it possible to use all of these skills?" Answer to Question of the day: "It's possible that some of the skills don't apply." 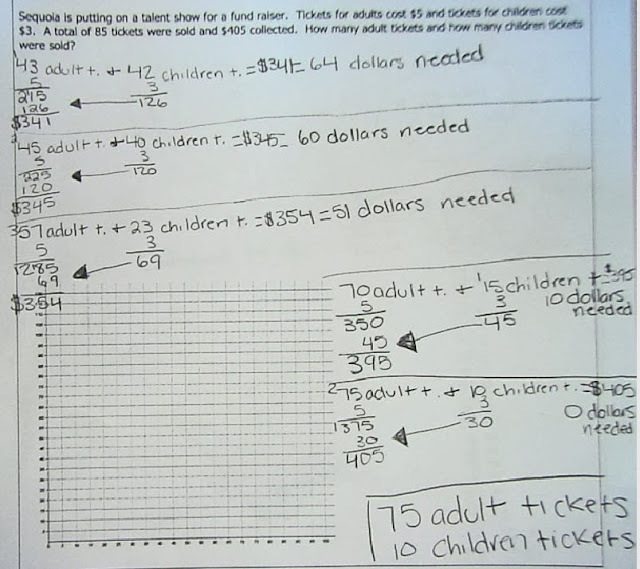 For this first iteration, I used the standard Ticket Problem. Below are samples of student work. 1) What are your thoughts on this process? 2) How did each student do?